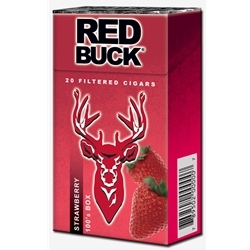 Red Buck Strawberry Filtered Cigars are available in Box 100's and packaged 20 cigars per pack, 10 packs to a carton for a total of 200 premium filtered cigars. Fast becoming a customer favorite and bestselling brand, the Red Buck line has made its mark as a high quality filtered cigar brand with a price that everyone can afford. The next time you’re in need a filtered cigar that offers a full-bodied taste and the kind of aroma that you can enjoy, purchase a carton of your favorite style of the Red Bucks at Smokers Discounts today. You won’t be disappointed!